What is the knowledge Center? The Knowledge Center is a quick and convenient way for irrigation professionals to learn for FREE about Rain Bird Landscape Irrigation products. Each product category includes a series of self-paced learning modules. Each module is 3- 10 minutes with a short quiz at the end. A certificate will be provided after each course has been successfully completed. Complete all modules in a product category to earn IA CEU credit. 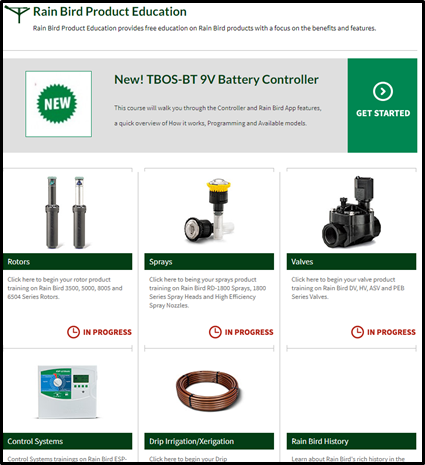 Easy and convenient – the Knowledge Center will help you build your Rain Bird product expertise. Copyright © 2019 Rain Bird International, Inc.